Mercedes-Benz is celebrating 60 years of the SL badge with the overhauled 2013 Mercedes SL, the first built almost entirely from aluminum. Let's call it Aluminum und Se… oh, wait... it's not an Audi. It's appropriate the car turns 60-years-old this year as it's a popular vehicle amongst a certain type of affluent man or woman enjoying their late mid-life crisis. They're a little too old to want to duck into an SLS, but want the same style. From a styling perspective, the 2013 SL takes multiple styling cues from the classic original, including the protruding grille and large venting behind the front wheel. The large headlines are also reminiscent of the second generation W113. It's striking in red on the Detroit Auto Show floor. From a technical perspective, they've lightened the car with a more extensive use of aluminum. One of the car's engineers joked that the the approximately 250 pounds dropped was "as if a heavyweight-class passenger had got out of the car." He's talking about you, America. In SL 500 trim the 4.6-liter V8 has evolved to produce 435 horsepower, an improvement of 12% over its predecessor while improving fuel efficiency by approximately 22%. 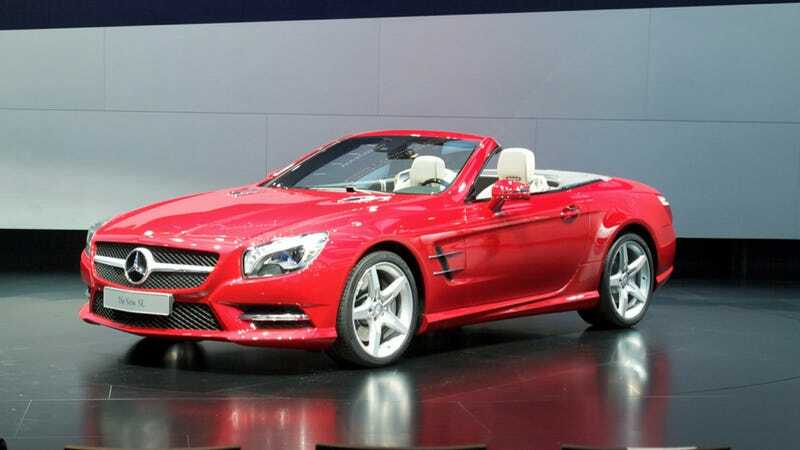 The new V6 in the SL 350 delivers a stronger 306 hp while using 30% less fuel. Both can thank the standard ECO start/stop function and 7G-TRONIC seven-speed transmission. More power and less weight means the SL 350 can jog to 62 mph in just 5.9 seconds. The SL 500 is, not surprisingly, even faster, having dropped nearly a second to reach the same speed from a cold stop in just 4.6 seconds. The one other change to note here is the hilariously named MAGIC VISION CONTROL. Does it see into the future? Anticipate the habit of other drivers? Accurately predict lotto numbers? No, no, and no. It's an "innovative wiper blade" that shoots warm water from the blade itself. No more getting yourself wet just so you can see. It's kind of an awesome idea, albeit one that'll probably be ridiculously expensive to replace.